Launched in January 2014, the Justice Circle is a group of Justice & Society Program supporters chaired by Tristan Duncan of Shook Hardy Bacon, LLP. It convenes creative and influential thought leaders to advance JSP’s work, bringing together individuals from diverse backgrounds to discuss the meaning of justice and how a just society ought to structure its legal, judicial, and political institutions. With an annual contribution of $10,000 or more, Circle members gain exclusive access to high-level gatherings in Washington, New York, Aspen, and other major US cities, including auditing of the Justice & Society Seminar. We also understand that many might want to remain connected to our work, but cannot join the Justice Circle at the $10,000 level. Hence, we also established the Justice Associates, where for a donation of at least $1000 annually and the commitment to an in-kind contribution, you too can be part of our work, and will be invited to several of our Justice Circle events each year. As with the Justice Circle, Justice Associate support helps others to attend the summer seminar who might not otherwise be able to. Members also help us focus on questions of equal justice, human rights, and other topics that you and we are passionate about. And members can be part of the larger Aspen Institute network. In-kind contribution may include hosting an event for others who are interested in our values-based civil approach to law and policy; writing a short article or book review for the Justice Circle Briefs newsletter; or helping us identify and secure as speakers and panelists emerging thinkers on critical issues, for events in Aspen, DC, New York City, and California. 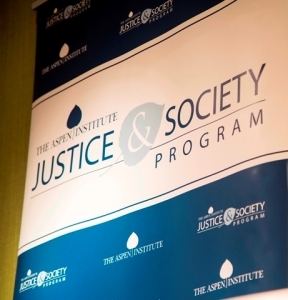 For more information about the Justice Circle, Justice Associates, or to become a member, please contact Meryl Chertoff, Executive Director of the Justice and Society Program, at Meryl.Chertoff@aspeninstitute.org or 202-736-2539.